Day 1: Mixed some ground beef and alfalfa powder in her breakfast. Day 2: Increased the amount of ground beef for breakfast. Dinner: daddy mistakenly gave Maya tomorrow's breakfast as dinner. Day 3: Breakfast: ate the chicken leg that was meant for last night's dinner. We will be out of town and Maya will be staying at a friend's place for 2 days, will be eating Nature's Variety's premade lamb for the next few meals so it won't be too troublesome. Day 4: Breakfast & dinner: premade lamb. Day 5: Breakfast & dinner: premade lamb. Didn't finish all her dinner. Day 6: Back home. Breakfast: 3oz ground beef + big chuck of veggie mix + uber powder. She didn't finish it, so I'll probably cut down the amount tomorrow. Dinner: chicken leg. Poop was pretty firm. Day 8: Added a cooked egg yolk and a sprinkle of garlic powder to her breakfast. Day 9: Had partially loose poop. Removing the garlic and will try cooked egg again. Day 10: She seems to have a habit of leaving one bite of her breakfast. So annoying. Day 11: Daddy accidentally gave her twice the amount for her breakfast, but she ate most of it (with 1 bite left, of course). We noticed that all the chicken meaty bones bought from Costco are enhanced (with sodium). Will try soaking the meat in water for an hour before feeding her from now on, till we finish the big bag of drumsticks. Done with detoxification? 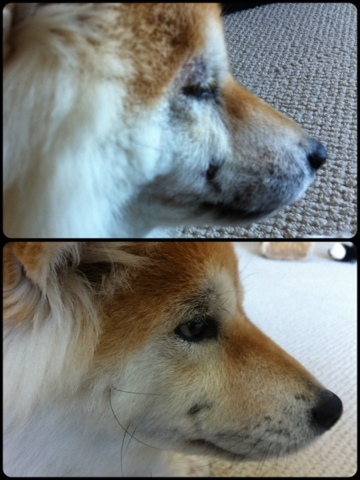 Her poop is now pretty firm and stable, no more eye gunk, and her fur is starting to grow back in.